Carnage and the Beast! Oh wait, I mean beauty! If you have not been paying attention to our posts on other social media you may not have realized that I managed to completely decimate the sprocket cover on my Ironhead Sportster chop. Here is the carnage! Opps! I was going to construct a whole new mount/ sprocket cover. But since I just wanted it done so I could ride I buzzed it back together. Hopefully this winter I will be able to get around to ordering up some material and fabbing one up! Oh and this is just another one of those slammed mornings getting everything shipped out! 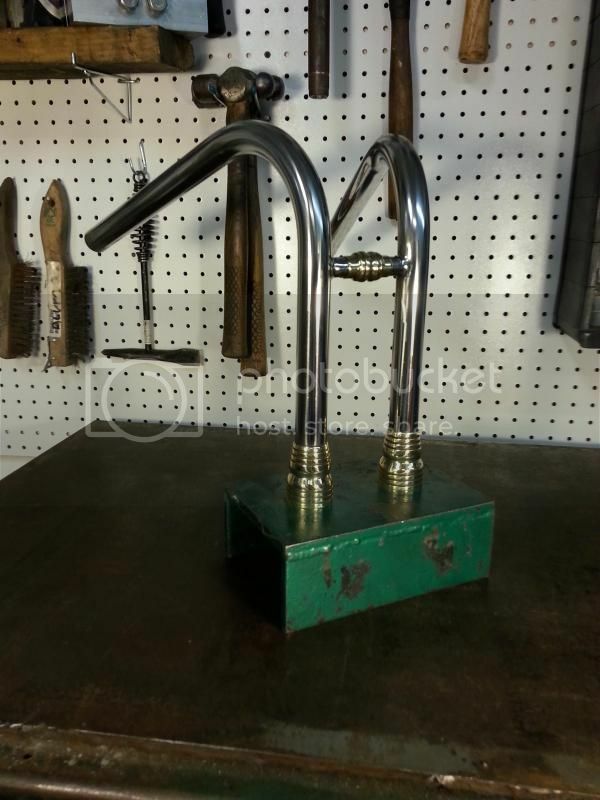 Deep Six Cycles Stainless Rabbit Ears and more! Oh and we can hook you up with pegs for those funky Ironhead and Shovel mounts! We have been selling quite a few of our brass products with and antiqued finish. See those pegs on the left? And these antiqued foot pegs and hand grips. Here are a set of Brass Hexogram Pegs, Brake peg and Grips with a special custom spin. What have we been up to? Well, really just settling into the new shop with East End Motorsports. Setting up the new spot, arranging, organizing and turning out products. We still ship Iron Pony Express from time to time. Wait, could it be? 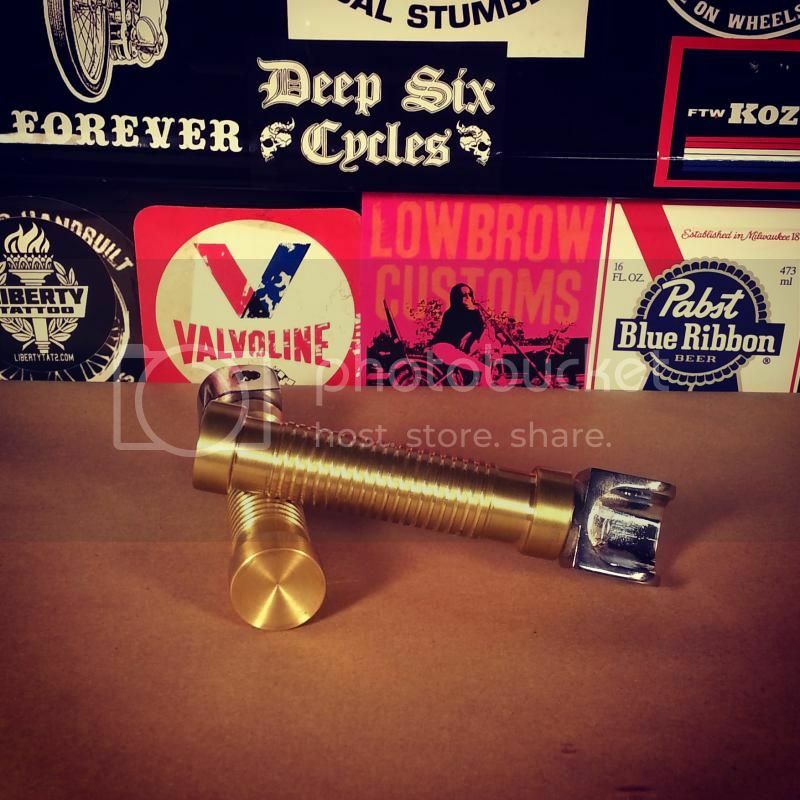 Brass Pegs that fit Ironhead Sportsters and Shovelheads? That's it man, we have them you want them! 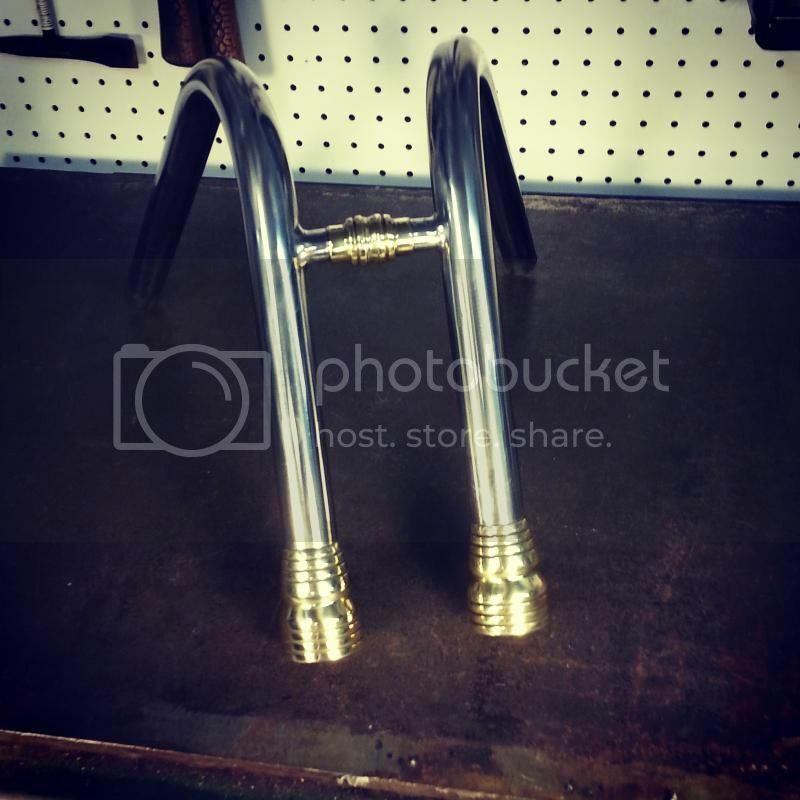 Did I mention that we have 1" Brass Foot Pegs for Iron Head Sportsters and Shovelheads? You know the ones you can't get nice pegs for any where. They fit those big ugly male frame mounts! 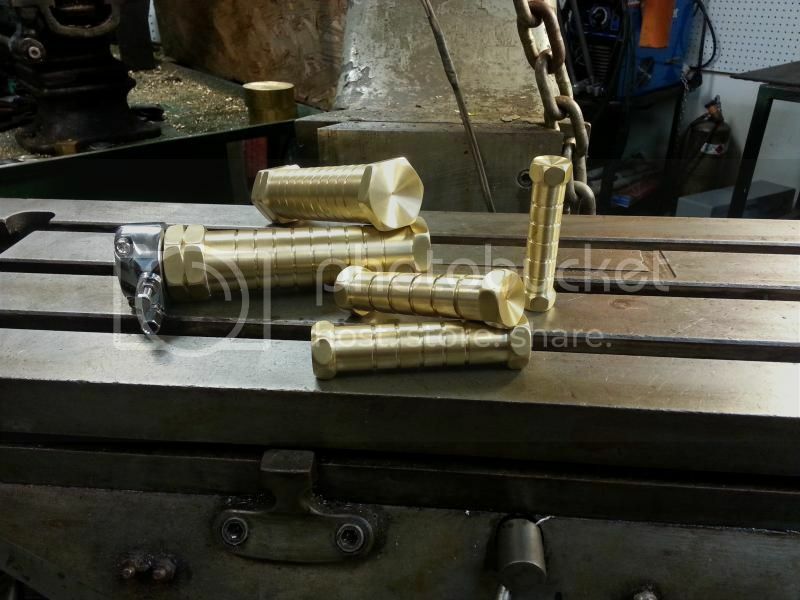 Here are a whole set of antiqued or "aged" brass hand grips and footpegs! I bet you didn't know we offered so many types of finish on our products. Here are a few more shots of the pegs. This has been a much requested finish on our brass products lately! Here we have our antiqued finish brass pegs on the right with common Harley style mounts on the left. 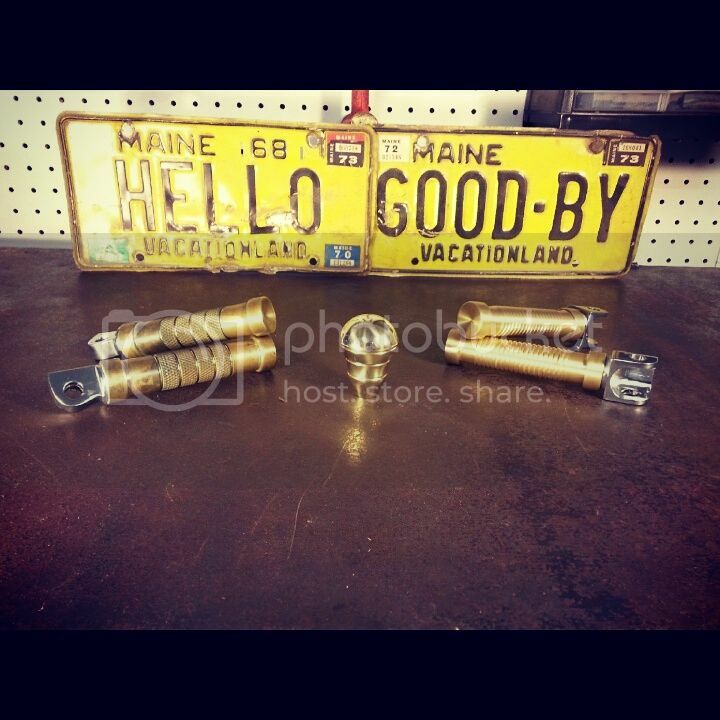 One of our polished brass jockey/suicide shift knobs in the center and our brass "Screw It" footpegs fitted with mounts for Ironhead and Shovelhead Harleys. Did you know that we still manually machine our parts? I know it's like the 50's never ended! Some times we get requests to produce a part based on one we offer already but with a little twist to fit our customers needs or taste. Take this set of Deep Six Cycles Hexogram brass handgrips. They feature a double hex on one end. Yes I know only old guys do it this way. Finishing up more parts and they are gone, gone, gone! I was forced to go down town the other day... Strangely The Cobblers Shoe (my bike) didn't have anything to do with my morning in traffic court. What have we been up to? Well lets have a look! I have been working on a new line of Rabbit Ear or "Pull Back" bars. They have a turned piece of brass pressed over the cross bar on them. These bars are reasonably priced at $115 plus shipping. Get them powder coated black while leaving the brass as it and watch every ones mind blow! We can also do variations on this design including making them from Stainless Tubing. 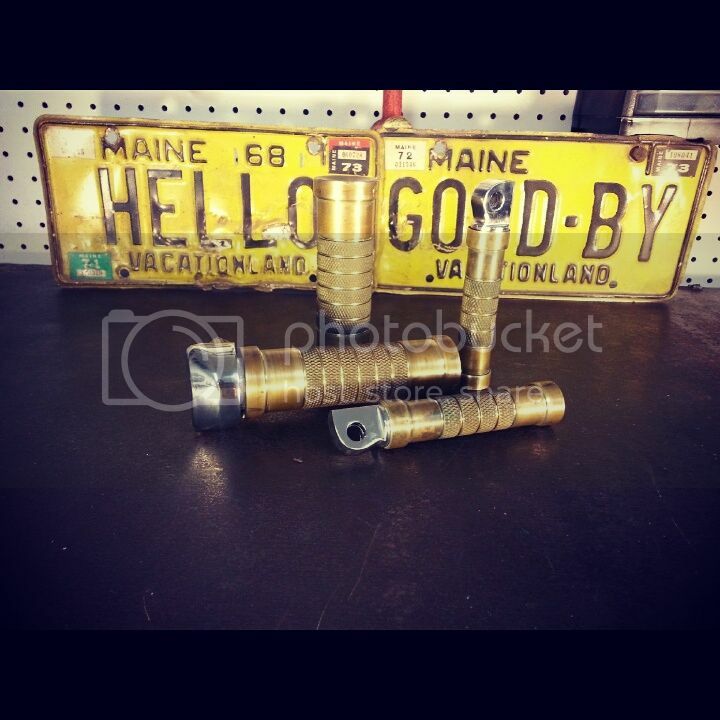 They look great with our Brass Grips, Pegs and other accessories. Check out our Web Store- Click here to see our Store! Or email us for more info- DeepSixCycles@gmail.com I still have a ton of ideas I need to put into production so keep checking back to see the latest!